Friday we hit the road again (what's new) and headed up north to spend sometime with our family. And then we sent him off to Trick or Treat where he found a friend that looked familiar Today (Sunday) we've had a pretty crazy day. We had a fall festival after church. I woke up extra early to bake some goodies to take. I have become a full fledged Betty Crocker. And now I'm excited because the holiday season is beginning!!! He is just the cutest little thing! I love that last picture of the two doggies. :) And I totally agree with you about the holiday season!! I love that the holiday season is beginning and Maxton is getting SO big!! he looked so great! Did he like the costume or hate it? That little Maxton is adorable!! What a cute little costume. So glad you had a wonderful weekend. Bring on the Holidays!!! Great pics! Maxton is so stinkin cute! Oh my gosh I am SOOOOOO excited that the holiday season has arrived! And you are not alone Betty Crocker, I have become a baking machine too! Here come the extra 10 holiday pounds that I DON'T need!! Have yall given up on house hunting again?? 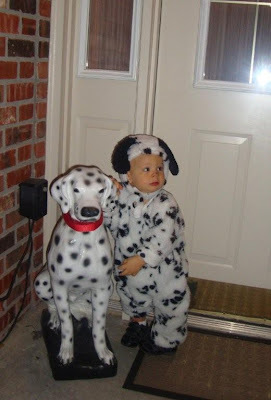 I love the pic of Maxton with the dalmation statue!!! What a cutie patootie baby! OMG how cute are you with your mom and sister? yall all look so much alike! preshious and your nephew is beyond adorable! 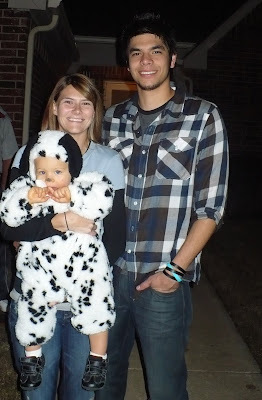 Maxton is super sweet in that puppy costume! 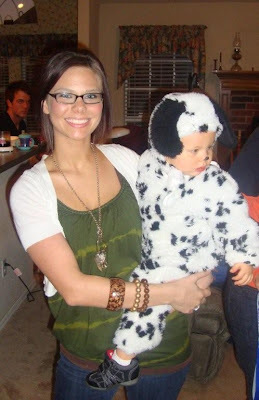 what a sweet little dalmation! love it! it sounds like you travel as much as we do! I seriously want to go 4-wheelin' now!! so fun! Maxton is a little cutie, such a great weekend with family! Love the pics of Maxton...he's so cute! !